Two lawsuits against the country's largest student loan servicer, Navient, could have an impact on your loans. In the aftermath of the the Consumer Financial Protection Bureau’s (CFPB) lawsuit against Navient, the largest student loan servicer in the country, we wanted to get in touch with our readers about what this could mean for their own student loans. It’s worth noting that a separate consumer class action lawsuit was filed days after the CFPB announced their lawsuit for borrowers that attempted to pay off their loans earlier by making larger payments than their monthly payment plan required them to. You can read more about whether you qualify for restitution under the Florida consumer class action lawsuit here. Read on even if Navient is not your student loan servicer. We think this lawsuit serves as a warning shot to other servicers who may be getting away with the same practices that put financial interests above consumers’ interests. Compensation for injury is not guaranteed: The CFPB is requesting that the court order Navient to pay restitution to affected borrowers in addition to a financial penalty. But because CFPB is a government agency and this lawsuit is not a class action lawsuit you should not expect redress at this particular point in time. You may be able to fire Navient: For borrowers with older federal student loans (under the FFEL program), you can consolidate your loans into Direct Loans and choose your servicer. You’ll also be able to enroll in more generous income-driven repayment plans and Public Service Loan Forgiveness. You should keep making your monthly payments on time: If you can afford to keep making your monthly payments on normal schedule you should absolutely do so. If you can no longer make your monthly payments, visit studentloans.gov to enroll in an Income-Driven-Repayment (IDR) plan. This can help you even if you are currently unemployed. You can follow us to view the progress of the CFPB lawsuit. Find out who your lender and servicer are: You can find out who your loan servicer is and get their contact info by logging onto your Federal Student Aid profile with your Federal Student Aid ID. Create an FSA ID if you don’t already have one. Know your rights as a borrower: You can find the full extent of your rights as a student loan borrower here. Understand all of your repayment options: Your loan servicer is supposed to help you navigate the many ways you can successfully repay your student loans but, as history shows us, these companies don’t always have consumers’ best interests in mind. That’s why it’s so important to educate yourself on the many repayment options for your unique financial situation. Find out about student loan refinancing, income-driven repayment, federal student loan consolidation and student loan forgiveness. If you’ve made payment decisions with your loan-servicer over the phone make sure you also confirm any changes in writing. Enroll in automatic monthly payments, which may reduce your interest rate and also guarantees your loan-servicer is always receiving your payments. Senya Merchant is an Organizing Associate for Generation Progress. I’ve gotten a ton of clients asking me about the Trump administration’s plans in regards to the Public Service Loan Forgiveness program (PSLF). For those who don’t know, PSLF allows you to work for a not for profit employer for 10 years and receive tax-free loan forgiveness. For many borrowers burdened by huge amounts of student debt, PSLF is their only hope. Here’s how you should prepare your finances if you’re worried about Trump repealing PSLF. I had an interesting conversation with a client a couple days ago about their $200,000+ student debt balance. She had the ability to refinance and was incredibly worried about Trump repealing PSLF. Hence, her thought was why not go ahead and lock in a lower interest rate and pay everything off. Otherwise she would have to take her chances with whatever the new administration will do over the next 10 years. If she stays on PSLF and files her certification paperwork, she’s on track to save about $200,000. If she refinances and avoids waiting around 10 years to find out PSLF doesn’t exist anymore, she could save about $50,000. Let’s think about this scenario like I would as a former bond trader. One outcome gives you savings of $200,000. The other outcome gives you savings of $50,000. The two options are mutually exclusive, meaning PSLF can’t exist and not exist at the same time. Therefore, if I wanted to decide what to do, I would multiple each of the numbers by the probability of each event and sum them. What is the PSLF Repeal Probability? This is a hard question to answer without freaking anyone out, because PSLF is almost certainly going to be repealed. However, the major question is HOW. The 2015 Republican repeal plan grandfathered in anyone who currently holds federal student debt. It does not apply to anyone seeking new debt. The Democrats also effectively proposed their own repeal plan in President Obama’s budget around the same time. The President tried to limit PSLF to $57,500 in max benefits. The Democrats’ PSLF repeal plan was actually far more damaging than the Republicans for current borrowers. Fast forward to January 2017, and Republicans have all the levers of power. Therefore, my expectation is that Trump repealing PSLF will happen within 12-18 months, especially given how the confirmation hearing for his Education Secretary hardly mentioned student loan policy. However, current borrowers are very likely going to be grandfathered in when the repeal happens. I’d put the odds at about 85% that this will happen, with odds of 15% that current borrowers will be completely screwed over. I’ll say though that these probabilities are my educated guess and take them with a grain of salt. Going back to the earlier example, say you have $200,000 of savings under PSLF or $50,000 in losses if you stay and it gets repealed. With my probabilities, the expected value of staying on PSLF is $200,000*0.85+(-$50,000)*0.15=$162,500. Even if the probability is 50/50, the expected value of staying on PSLF is still very positive. Therefore, if you’re looking at PSLF logically as an investment professional would, you need to be staying on the program if your savings are significant. So what about my guess that there’s a 15% chance that Trump repealing PSLF becomes reality? If I told you that there was a 15% chance of something horrible happening, you wouldn’t feel so good. That’s why you need to prepare your finances just in case the worst becomes reality. After all, many election models had Trump’s chances at below 5%. Borrowers going for PSLF fall into two camps. The first group could pay their student debt off if they wanted to. They’re pursuing PSLF because it’s a better financial decision, not because it’s their only option. The second group can never repay their student debt. They will be forced onto private sector loan forgiveness in the absence of PSLF. Borrowers in the first group will have debt to income ratios below 2. They will refinance their loans with a lender like the ones in my sidebar above. Then, they’ll get the lowest interest rate they can and pay it back. Borrowers in the second group will need to save a lot of money. For repayment plans like IBR, an individual with a $400,000 student debt balance might have a balance of $600,000 after 25 years of not covering the full interest payments. That borrower would then owe taxes on the $600,000 forgiven balance as if it was income. The only way to pay that burden is to save $500-$1,000 a month in an investment account at a place like Vanguard. When the tax bomb hits, you withdraw the full amount, pay taxes on your capital gains, and pay off the tax debt. Trump repealing PSLF would be bad news for a large number of borrowers. That said, it doesn’t have to be a disaster. Plan for PSLF with your loan repayment strategy. Fill out the PSLF certification form. Maybe consider submitting it every 6 months instead of every year. If you stop building progress towards tax free loan forgiveness, you’re giving up the potential future savings that could very well happen. We’re all probably going to be dealing with higher tax rates in the future anyway, so you might as well get all the benefits you’re eligible for. Hedge your risk against PSLF repeal. Save aggressively outside of your retirement plan. 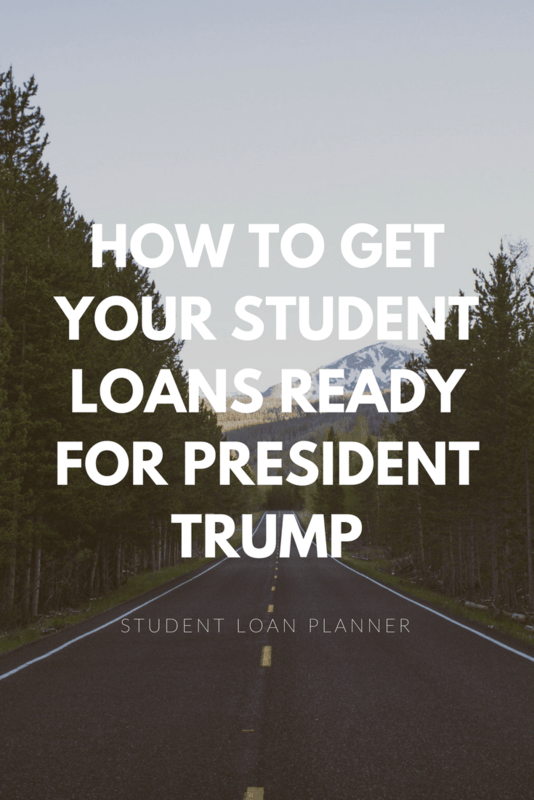 If Trump destroys PSLF, then you can retool your loan strategy accordingly. What Is the William D. Ford Act? Important Notice: This Borrower’s Rights and Responsibilities Statement provides additional information about the terms and conditions of the loans you receive under the accompanying Master Promissory Note (MPN) for Federal Direct Stafford/Ford Loans (Direct Subsidized Loans) and Federal Direct Unsubsidized Stafford/Ford Loans (Direct Unsubsidized Loans). Please keep this Borrower’s Rights and Responsibilities Statement for your records. You may request another copy of this Borrower's Rights and Responsibilities Statement at any time by contacting the Direct Loan Servicing Center. Throughout this Borrower’s Rights and Responsibilities Statement, the words “we,” “us,” and “our” refer to the U.S. Department of Education. The word “loan” refers to one or more loans made under the accompanying MPN. 1. The William D. Ford Federal Direct Loan Program. The William D. Ford Federal Direct Loan (Direct Loan) Program includes the following types of loans, known collectively as “Direct Loans”: • Federal Direct Stafford/Ford Loans (Direct Subsidized Loans) • Federal Direct Unsubsidized Stafford/Ford Loans (Direct Unsubsidized Loans) • Federal Direct PLUS Loans (Direct PLUS Loans) • Federal Direct Consolidation Loans (Direct Consolidation Loans) The Direct Loan Program is authorized by Title IV, Part D, of the Higher Education Act of 1965, as amended. You must complete a Free Application for Federal Student Aid (FAFSA) before you receive a Direct Subsidized Loan or Direct Unsubsidized Loan. Direct Loans are made by the U.S. Department of Education. Our Direct Loan Servicing Center services, answers questions about, and processes payments on Direct Loans. We will provide you with the address and telephone number of the Direct Loan Servicing Center after the school notifies us that the first disbursement of your loan has been made. 2. Laws that apply to this MPN. The terms and conditions of loans made under this MPN are determined by the Higher Education Act of 1965, as amended (20 U.S.C. 1070 et seq.) and other applicable federal laws and regulations. These laws and regulations are referred to as “the Act” throughout this Borrower’s Rights and Responsibilities Statement. State law, unless it is preempted by federal law, may provide you with certain rights, remedies, and defenses in addition to those stated in the MPN and this Borrower’s Rights and Responsibilities Statement. NOTE: Any change to the Act applies to loans in accordance with the effective date of the change. 3. Direct Subsidized Loans and Direct Unsubsidized Loans. Direct Subsidized Loans and Direct Unsubsidized Loans are made to students to help pay for the cost of education beyond high school. To receive a Direct Subsidized Loan, you must have financial need. We do not charge interest on Direct Subsidized Loans while you are in school and during certain other periods. Direct Unsubsidized Loans are not based on financial need. We charge interest on Direct Unsubsidized Loans during all periods. For more information on interest charges, see item #9 of this Borrower’s Rights and Responsibilities Statement (“Payment of interest”). 4. About the MPN. You may receive more than one loan under this MPN over a period of up to 10 years to pay for your educational costs, as long as the school you are attending is authorized to use the multi-year feature of the MPN and chooses to do so. If your school is not authorized to use the multi-year feature of the MPN or chooses not to do so, or if you do not want to receive more than one loan under this MPN, you must sign a new MPN for each loan that you receive. If you do not want to receive more than one loan under this MPN, you must notify your school or the Direct Loan Servicing Center in writing. 5. Use of your loan money. You may use the loan money you receive only to pay for your authorized educational expenses for attendance at the school that determined you were eligible to receive the loan. Authorized expenses include the following: • Tuition • Room • Board • Institutional fees • Books • Supplies • Equipment • Dependent child care expenses • Transportation • Commuting expenses • Rental or purchase of a personal computer • Loan fees • Other documented, authorized costs 6. Information you must report to us after you receive your loan. You must notify the Direct Loan Servicing Center and/or the financial aid office at your school about certain changes. Until you graduate or otherwise leave school, you must notify your school’s financial aid office if you: • Change your address or telephone number; • Change your name (for example, maiden name to married name); • Do not enroll at least half-time for the loan period certified by the school • Do not enroll at the school that determined you were eligible to receive the loan; • Stop attending school or drop below half-time enrollment; • Transfer from one school to another school; or • Graduate. You must also notify the Direct Loan Servicing Center if any of the above events occur at any time after you receive your loan. In addition, you must notify the Direct Loan Servicing Center if you: • Change your employer, or your employer’s address or telephone number changes; or • Have any other change in status that would affect your loan (for example, if you received a deferment while you were unemployed, but you have found a job and therefore no longer meet the eligibility requirements for the deferment). 7. Amount you may borrow. The charts that follow show the maximum amounts of Direct Subsidized Loans and Direct Unsubsidized Loans that you may borrow for a single academic year (annual loan limits), and the maximum amounts that you may borrow in total for undergraduate and graduate study (aggregate loan limits). The annual and aggregate loan limits for independent undergraduates also apply to dependent undergraduates whose parents are unable to borrow under the PLUS program. If you are enrolled in certain health professions programs, you may qualify for higher annual and aggregate limits on Direct Unsubsidized Loans. The actual loan amount you receive will be determined by your school, based on your academic level, dependency status, and other factors such as: • The length of the program or the remaining portion of the program in which you are enrolled, if it is less than a full academic year; • Your cost of attendance; • Your Expected Family Contribution; • Other financial aid you receive; and • Your remaining eligibility under the annual or aggregate loan limits. The actual amount you receive for an academic year may be less than the maximum annual amounts shown in the charts. If you are an undergraduate student, your school must determine your eligibility for a Federal Pell Grant before you may receive a Direct Subsidized Loan or Direct Unsubsidized Loan. Your school is also required to determine your eligibility for a Direct Subsidized Loan before determining your eligibility for a Direct Unsubsidized Loan. If you have received student loans from another federal student loan program, you are responsible for informing your school and your lender of your other student loans. In some cases, you may not be eligible for loans for which you have applied. Annual Loan Limits for Direct Subsidized Loans and Direct Unsubsidized Loans: Dependent Undergraduate Students (except students whose parents cannot borrow PLUS loans) First Year Total (maximum $3,500 subsidized) $5,500 Second Year Total (maximum $4,500 subsidized) $6,500 Third Year and Beyond (each year) (maximum $5,500 subsidized) $7,500 Independent Undergraduate Students (and dependent students whose parents cannot borrow PLUS loans) First Year Total (maximum $3,500 subsidized) $9,500 Second Year (maximum $4,500 subsidized) $10,500 Third Year and Beyond (each year) (maximum $5,500 subsidized) $12,500 Graduate and Professional Students Total Amount (each year) (maximum $8,500 subsidized) $20,500 Aggregate Loan Limits for Direct Subsidized and Direct Unsubsidized Loans: Dependent Undergraduate Students (except students whose parents cannot borrow PLUS loans) Total Amount Cumulative (maximum $23,000 subsidized) $31,000 Independent Undergraduate Students (and dependent students whose parents cannot borrow PLUS loans) Total Amount Cumulative (maximum $23,000 subsidized) $57,500 Graduate and Professional Students Total Amount Cumulative (maximum $65,500 subsidized; includes Stafford Loans received for undergraduate study) $138,500 8. Interest rate. The interest rate on Direct Subsidized Loans and Direct Unsubsidized Loans is a fixed rate. Teaching in a designated teacher shortage area (for a maximum of three years); • On parental leave (for a maximum of six months); or • A working mother entering or re-entering the workforce (for a maximum of one year). You may receive a deferment based on your enrollment in school on at least a half-time basis if (1) you submit a deferment request form to the Direct Loan Servicing Center along with documentation of your eligibility for the deferment, or (2) the Direct Loan Servicing Center receives information from the school you are attending that indicates you are enrolled at least half-time. If the Direct Loan Servicing Center processes a deferment based on information received from your school, you will be notified of the deferment and will have the option of canceling the deferment and continuing to make payments on your loan. For all other deferments, you (or, for a deferment based on active duty military service or qualifying National Guard duty during a war or other military operation or national emergency, a representative acting on your behalf) must submit a deferment request form to the Direct Loan Servicing Center, along with documentation of your eligibility for the deferment. In certain circumstances, you may not be required to provide documentation of your eligibility if the Direct Loan Servicing Center confirms that you have been granted the same deferment for the same period of time on a FFEL Program loan. The Direct Loan Servicing Center can provide you with a deferment request form that explains the eligibility and documentation requirements for the type of deferment you are requesting. You may also obtain deferment request forms and information on deferment eligibility requirements from the Direct Loan Servicing Center’s web site. If you are in default on your loan, you are not eligible for a deferment. You are not responsible for paying the interest on a Direct Subsidized Loan during a period of deferment. However, you are responsible for paying the interest on a Direct Unsubsidized Loan during a period of deferment. Forbearance We may give you a forbearance if you are temporarily unable to make your scheduled loan payments for reasons including, but not limited to, financial hardship and illness. We will give you a forbearance if: • You are serving in a medical or dental internship or residency program, and you meet specific requirements; • The total amount you owe each month for all of the student loans you received under Title IV of the Act is 20 percent or more of your total monthly gross income (for a maximum of three years); • You are serving in a national service position for which you receive a national service award under the National and Community Service Trust Act of 1993. In some cases, the interest that accrues on a qualified loan during the service period will be paid by the Corporation for National and Community Service; • You are performing service that would qualify you for loan forgiveness under the teacher loan forgiveness program that is available to certain Direct Loan and FFEL program borrowers; • You qualify for partial repayment of your loans under the Student Loan Repayment Program, as administered by the Department of Defense; or • You are called to active duty in the U.S. Armed Forces. To request a forbearance, contact the Direct Loan Servicing Center. The Direct Loan Servicing Center can provide you with a forbearance request form that explains the eligibility and documentation requirements for the type of forbearance you are requesting. You may also obtain forbearance request forms and information on forbearance eligibility requirements from the Direct Loan Servicing Center’s web site. Under certain circumstances, we may also give you a forbearance without requiring you to submit a request or documentation. These circumstances include, but are not limited to, the following: • Periods necessary for us to determine your eligibility for a loan discharge; • A period of up to 60 days in order for us to collect and process documentation related to your request for a deferment, forbearance, change in repayment plan, or consolidation loan (we do not capitalize the interest that is charged during this period); or • Periods when you are involved in a military mobilization, or a local or national emergency. You are responsible for paying the interest on both Direct Subsidized Loans and Direct Unsubsidized Loans during a period of forbearance. 21. Discharge (having your loan forgiven). We will discharge (forgive) your loan if: • You die. The Direct Loan Servicing Center must receive acceptable documentation of your death, as defined in the Act. • Your loan is discharged in bankruptcy. However, federal student loans are not automatically discharged if you file for bankruptcy. In order to have your loan discharged in bankruptcy, you must prove to the bankruptcy court that repaying the loan would cause undue hardship. • We determine that you are totally and permanently disabled (as defined in the Act), based on a physician’s certification, and you meet additional requirements during a 3-year conditional discharge period. During that period, your earnings from work must not exceed the poverty line amount for a family of two, and you must not receive any additional loans under the Direct Loan, FFEL, or Federal Perkins Loan programs. You may not receive a discharge due to total and permanent disability based on a condition that existed before your loan was made, unless a doctor certifies that the condition substantially deteriorated after the loan was made. In certain cases, we may also discharge all or a portion of your loan if: • You could not complete a program of study because the school closed; • Your loan eligibility was falsely certified by the school; • A loan in your name was falsely certified as a result of a crime of identity theft; or • The school did not pay a refund of your loan money that it was required to pay under federal regulations. We may forgive a portion of any student loans you received under the Direct Loan or FFEL program after October 1, 1998 if you teach full time for five consecutive years in certain low-income elementary and/or secondary schools and meet certain other qualifications, and if you did not owe a Direct Loan or FFEL program loan as of October 1, 1998, or as of the date you obtain a loan after October 1, 1998. A public service loan forgiveness program is also available Under this program, the remaining balance due on your eligible Direct Loan Program loans may be cancelled after you have made 120 payments on those loans (after October 2, 2007) under certain repayment plans while you are employed in certain public service jobs. To request a loan discharge based on one of the conditions described above (except for discharges due to death or bankruptcy), you must complete a loan discharge application that you may obtain from the Direct Loan Servicing Center. In some cases, you may assert, as a defense against collection of your loan, that the school did something wrong or failed to do something that it should have done. You can make such a defense against repayment only if the school’s act or omission directly relates to your loan or to the educational services that the loan was intended to pay for, and if what the school did or did not do would give rise to a legal cause of action against the school under applicable state law. If you believe that you have a defense against repayment of your loan, contact the Direct Loan Servicing Center. We do not guarantee the quality of the academic programs provided by schools that participate in federal student financial aid programs. You must repay your loan even if you do not complete the education paid for with the loan, are unable to obtain employment in the field of study for which your school provided training, or are dissatisfied with, or do not receive, the education you paid for with the loan. 22. Loan consolidation. A Direct Consolidation Loan Program is available that allows you to consolidate (combine) one or more of your eligible federal education loans into one loan. Consolidation allows you to extend the period of time that you have to repay your loans, and to combine several loan debts into a single monthly payment. This may make it easier for you to repay your loans. However, you will pay more interest if you extend your repayment period through consolidation, since you will be making payments for a longer period of time. Contact the Direct Loan Servicing Center for more information about loan consolidation. 23. Department of Defense and other federal agency loan repayment. Under certain circumstances, military personnel may have their federal education loans repaid by the Secretary of Defense. This benefit is offered as part of a recruitment program that does not apply to individuals based on their previous military service or to those who are not eligible for enlistment in the U.S. Armed Forces. For more information, contact your local military service recruitment office. Other agencies of the federal government may also offer student loan repayment programs as an incentive to recruit and retain employees. Contact the agency’s human resources department for more information. 24. AmeriCorps program education awards. Under the National and Community Service Act of 1990, you may receive an education award that can be used to repay a Direct Subsidized Loan or Direct Unsubsidized Loan if you successfully complete a term of service in an AmeriCorps program. For more information, contact an official of your program. 1 The estimated payments were calculated using a fixed interest rate of 6.80%. 2 This repayment plan is available only to borrowers who have an outstanding balance on Direct Loan Program loans that exceeds $30,000, and who had no outstanding balance on a Direct Loan Program loan as of October 7, 1998 or on the date they obtained a Direct Loan Program loan on or after October 7, 1998. 3 These amounts are fixed, rounded to the nearest dollar, and calculated based on a 25-year repayment term. 4 This is your beginning payment, which may increase during your 10-year repayment term. 5 Assumes a 5% annual income growth (Census Bureau). 6 The estimated payments were calculated using the formula requirements in effect during 2006. 7 HOH is Head of Household; assumes a family size of two. http://studentloansfaqs.net/wp-content/uploads/2017/02/william-d-ford-act.jpg 614 800 Student Loans FAQ Rep http://studentloansfaqs.net/wp-content/uploads/2017/01/student-loans-faqs-logo-400x150.png Student Loans FAQ Rep2017-02-15 12:31:492017-02-22 12:33:22What Is the William D. Ford Act?